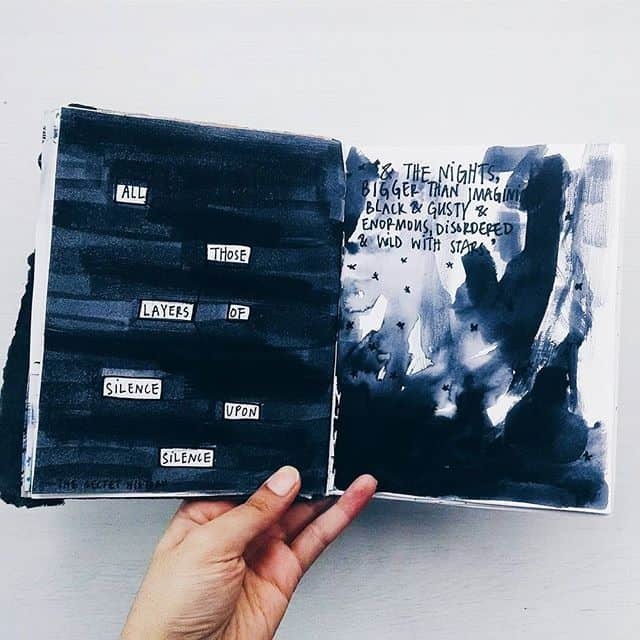 These dark bullet journal themes will blow you away – so be brave and give a white on black spread a try yourself next month! 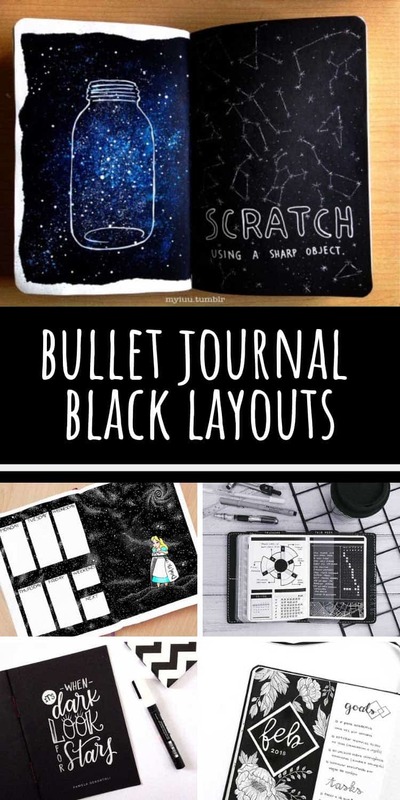 Ever since I shared a white on black layout as part of the monthly spread collection I keep seeing these AMAZING dark bullet journal ideas. So I decided it was time to round them up into an eye candy post to inspire you to add a striking layout to your set up next month! Oh and if you’re wondering how to actually create these white on black spreads in your journal there are a few different things you can do. 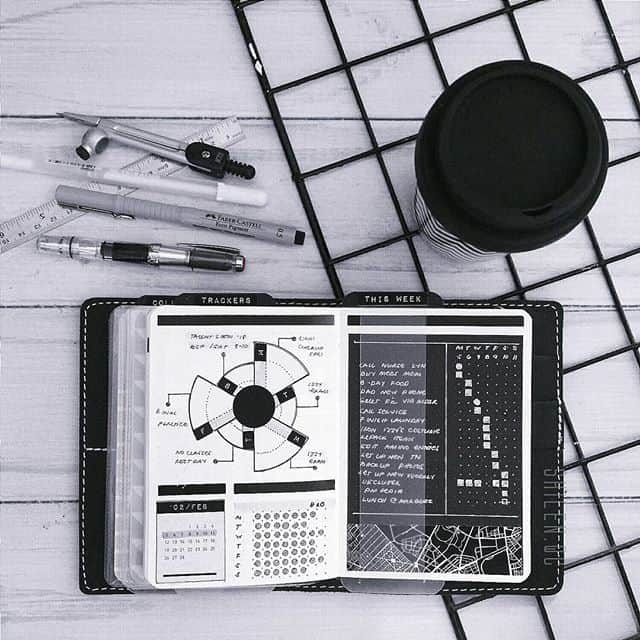 First up, if you use a Midori travelers notebook to journal in you can buy some black paper inserts like these which come in lined, dots or grid options. You will then need a white pen to write or draw with. 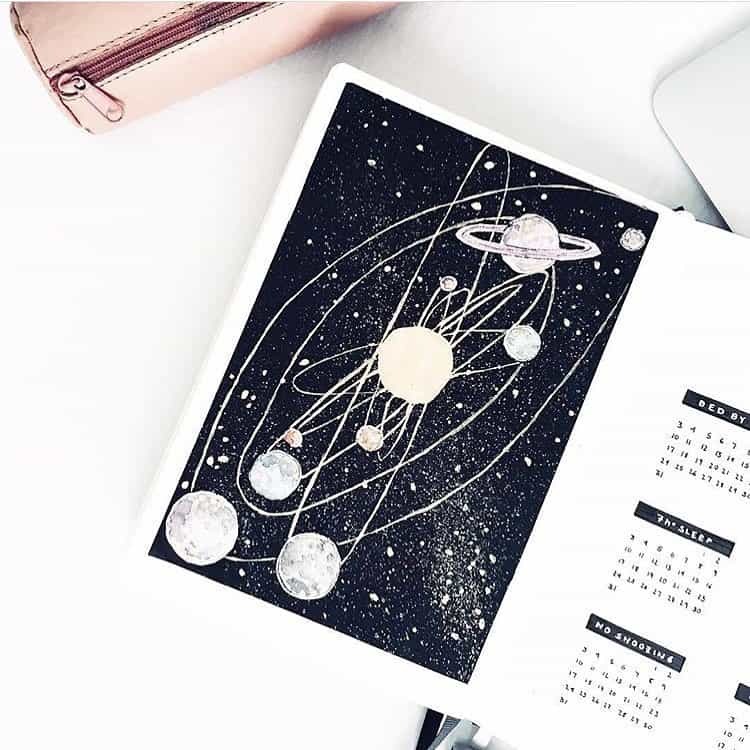 Let’s kick off today’s dark bullet journal themes with this amazing solar system illustration that would make a great cover page. Here’s another example of a cover page with a black background. This one was for October with some fabulous hygge doodles for the month’s goals. But you could apply this idea to any month of the year! If you like mixed media spreads you totally need to spend some time stalking mereljournals’ instagram because her spreads are amazing! 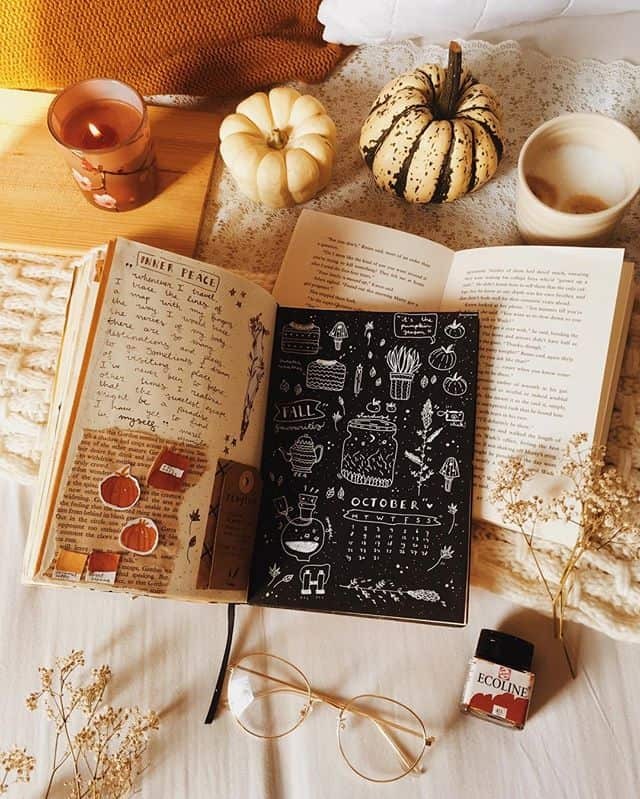 Do you use your BUJO as a book journal? 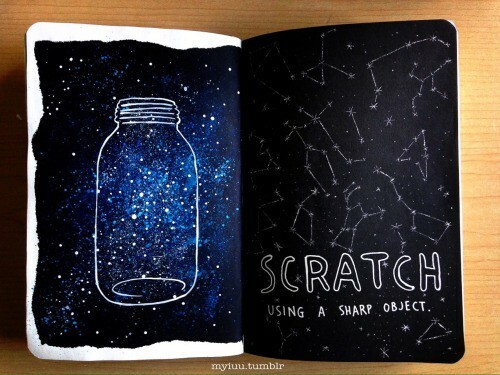 Here’s a very powerful spread that hawwaetc created after reading Donna Tartt’s A Secret History. Did you ever make those pictures when you were a kid where you scratched a black page with a sharp wooden tool and the colors that were underneath were revealed? 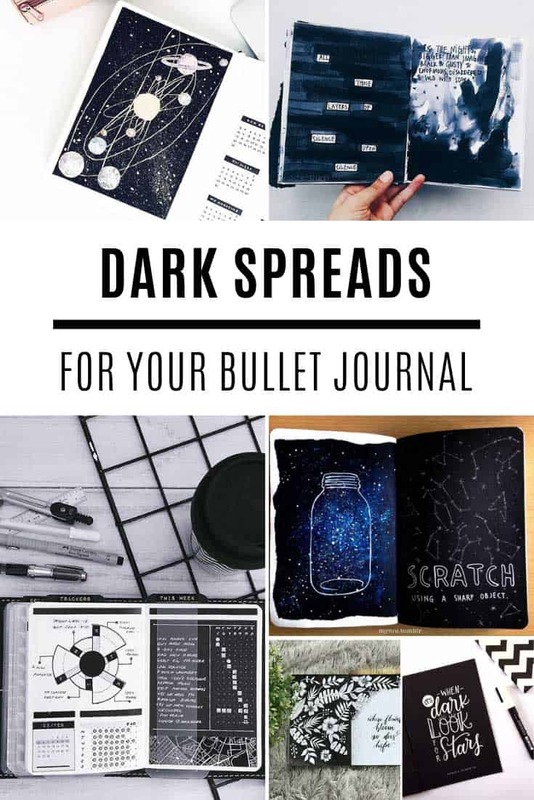 Such a great idea for a bullet journal layout right? Here’s a video tutorial to show you how to do it! 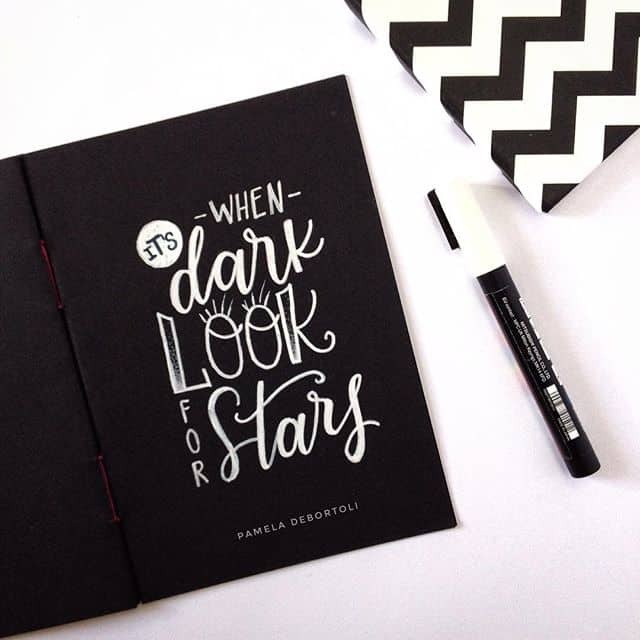 If you’ve been practicing your hand lettering a white on black layout is the perfect way to show off a quote in your journal. 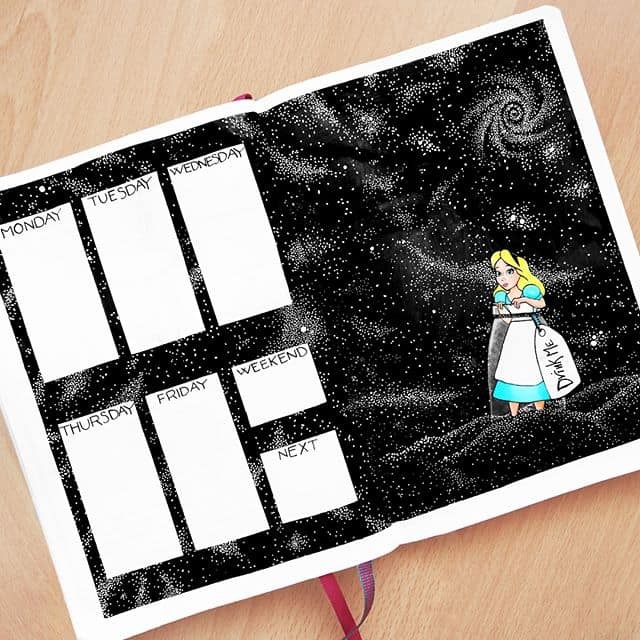 How’s this for a weekly spread idea? Alice down the rabbit hole! I Love all of those white starbursts and swirls! When we think floral we’re usually thinking shades of green right? 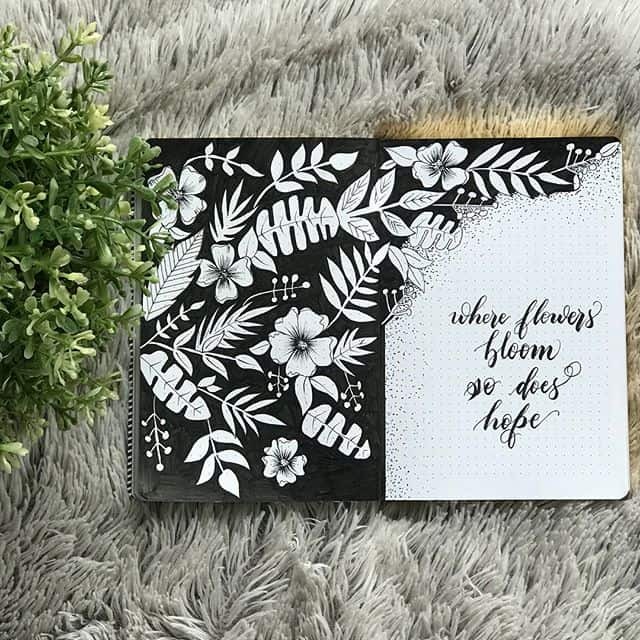 But how striking do these flowers look drawn in white on the black page? I really like the sort of torn edge effect separating the black from the white area where the quote has been written. 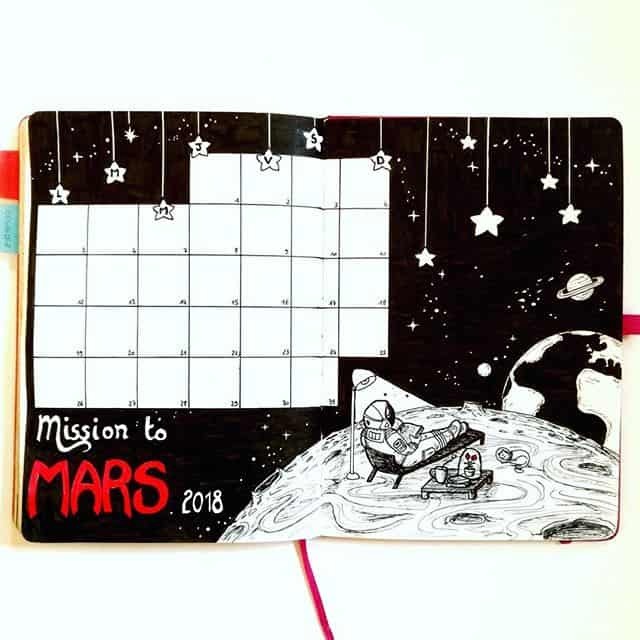 Here’s another space themed spread making the most of the black page. I just love that astronaut chilling out on his lounger gazing at the earth! And here’s how you apply the dark theme to a habit tracker. I really like the balance of the white on black on the right agains the heavy black on white on the left. 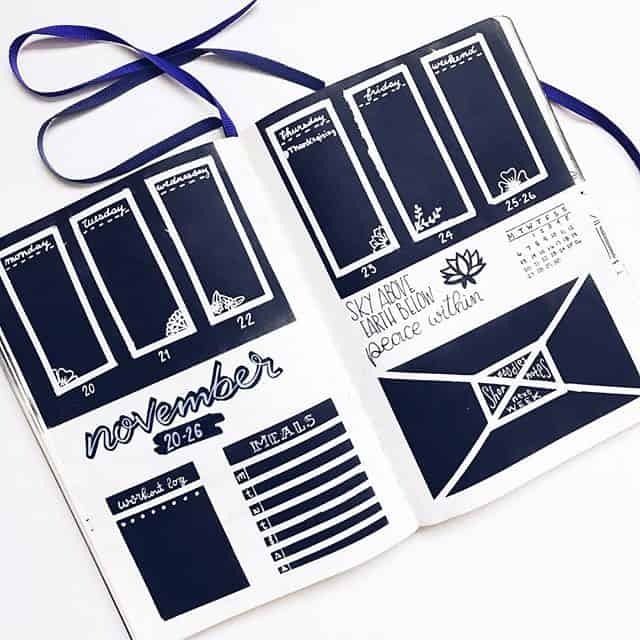 Have you tried a cover flap in your journal yet? 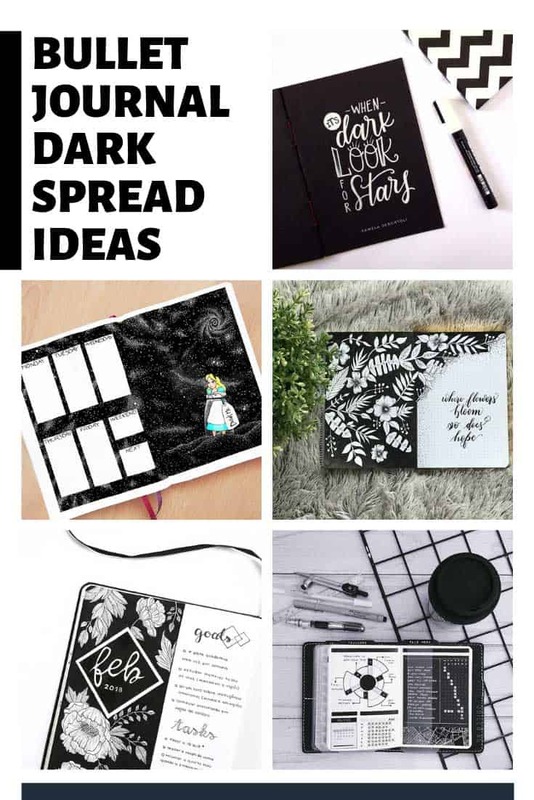 This is a really good way to do a dark spread without getting messy with black paint because you just use your white pen on a black sheet of paper and then tape it in to create the flap. 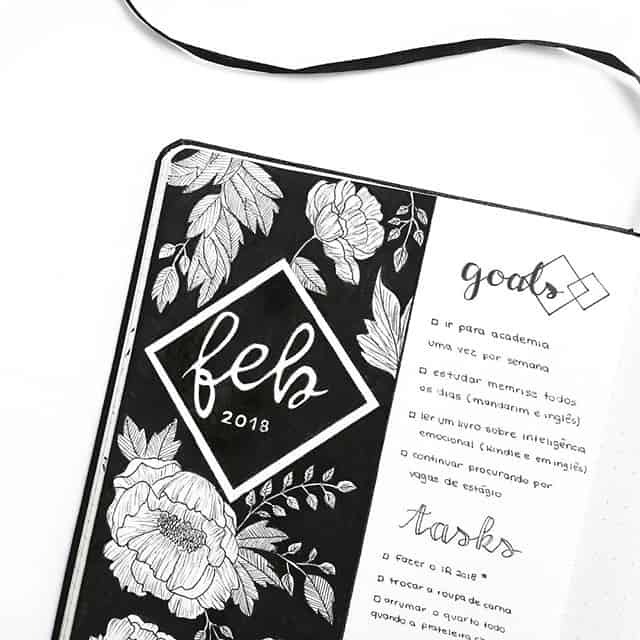 If you’re not ready to go all out black on your page try a weekly spread like this one which has a nice balance of black and white. This time the black boxes were made using black ink from a pad, with a beauty blender to sponge it onto the page, after it was taped off with washi tape of course! Next PostNext Adorable Crochet Pig Patterns Your Kids Will Love!